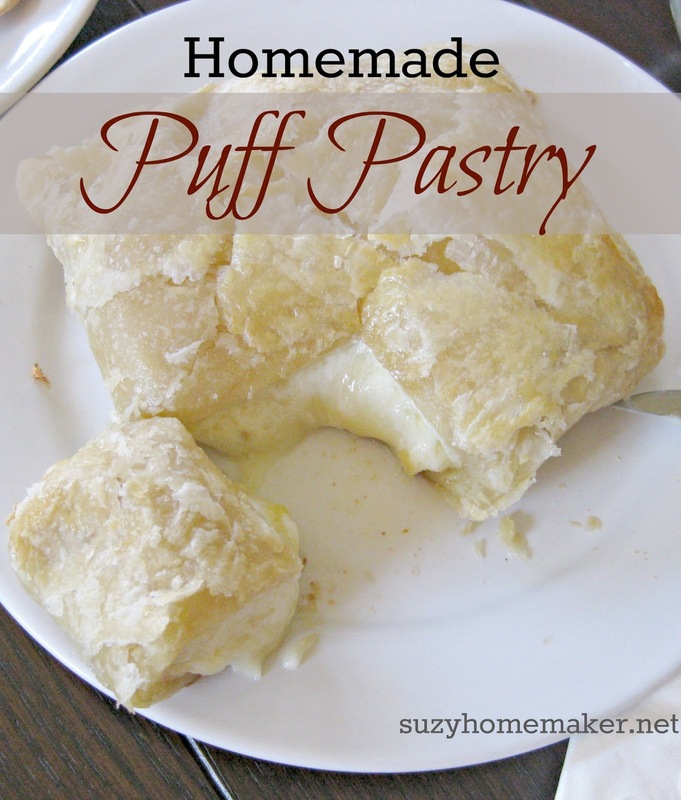 Puff pastry - From Scratch! For Easter I decided to make an appetizer of brie cheese baked in a puff pastry. I had done it once before and it was a hit, but I had just used store bought puff pastry. I included many pictures in this post. It was actually much easier than I expected. It does take some time, but you can leave the dough and come back later many times. Add the salt and the water and mix them together with a fork. Form the dough into a ball. Place on a floured cutting board or other surface. Place dough under bowl and let rest for about 5 minutes. Knead the dough for five minutes. Roll out the get a rectangle ~ 11 by 6 inches. Place the butter on one end of the rolled dough. Take chilled dough out of fridge. Place it on a floured surface with the fold on the left side and pound down with a roller. Roll the dough out to a rectangle 18 by 6 inches. Lift occasionally to re-flour the surface so it does not stick. Fold the dough into thirds. Turn it clockwise one rotation so the fold is not facing you. Once you have done your 6 "roll and refolds" you can roll out your dough to the shape you would like, chill if it warmed up too much and then bake. Cut the edges with a sharp knife so that the layers of pastry can separate. I baked my pastry at 400 degrees for 23 minutes. I think I could have baked it a bit longer to get a browner color. I also could have rolled it a bit thinner. It was just slightly too doughy.